Ehkzu Artzu: Tangled--no spoilers review--see it before it leaves the theaters! 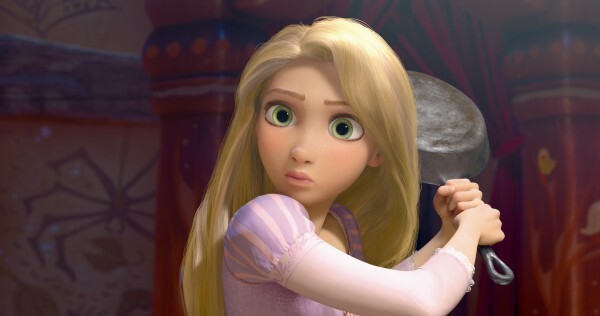 Tangled--no spoilers review--see it before it leaves the theaters! We saw "Despicable Me" in 2D a few night ago, and it made me determined to see "Tangled" in 3D before it left the theaters. I was right. The animation is so textured, so fine-grained, so exhiliratingly believable, I had to focus to deal with the story. And the story was written by the guy who wrote "Bolt," and this is comparably good, so if you liked that seeing this should be a no-brainer decision. And the animation and 3D qualities are even better--and Bolt was really good that way. 1. Story: Kids can get it but adults (most adults at least) won't be sitting there drumming their fingers. It's generally light-hearted but has some really serious moments. Remember, Disney started off "Bambi" with his mother being shot by hunters. So don't think "Disney" automatically means fluff. 2. Music: generally forgettable, though not sappy or annoying--just not great. One song reminded both my wife & me of Ursula the witch's song in "Little Mermaid,"
3. Characters / character development: satisfying. Adults will see what's coming, generally, but that's not always a bad thing. Art stems from ritual, which by definition repeats tribal themes. The heroine is a spunky young lady who learns yada yada, the hero is a Player who learns yada yada, The sidekick is a small lizard that thankfully doesn't speak but is quite expressive--not to mention being color-coordinated for each moment. Ditto a horse (only without the color coordination). The villain is less interesting but works OK.
4. Visuals: stunning, stunning, stunning. The literati disdain such superficialities, but that's kind of silly. Emotional nuance counts, but sheer exuberant human and natural beauty do too. The humans are rendered in a stylized manner, with giant eyes like you might find on a nocturnal mammal or a Japanese anime (though it doesn't have the look of Japanese anime). You can really see the leaps animation has made even in the last year. This isn't as spectacular as Avatar (what is? ), but hair and swirling layers of clothing are even better (and the characters are more likeable, BTW). And I'm not just talking about the action setpieces. There's moment with flowers floating on a lake that's quietly gorgeous, with the water actually waterlike. 5. Language: colloquial American English, which is anachronistic, but in keeping with the movie's vibe. It lends to a certain knowing quality to the film. I think my favorite anime is still "Spirited Away" but this was, well, spirited in its own right, and exuberantly American in its feel, despite not being set in America (it's a very au courant retelling of the fairytale of Rapunzel). This got 93% Tomatometer Top Critics rating from Rottentomatoes.com. I don't know of any second-rate movies that got such a high ranking. This is a perfect holiday film to bring the extended family to, as long as you bear in mind the serious/scary elements--some kids will treat these with aplomb, while others the same age will not. Forewarned is forearmed. Finally, when we get the DVD in 2D at least we'll be able to see it remembering how cool it was in 3D. So until we all have 3D TVs, this must be seen in a theater to get the real film. The DVD will be an echo of this.